Carpet. Tile. Wood. Like a kind of flooring material triumvirate, each of these is a power in its own right, but often works in conjunction with the others. While other products like laminate and vinyl are gaining popularity, these three remain the most common surfaces in a household. Zerorez knows them well. We revive the dirtiest carpet, reseal the most problematic grout and buff any hardwood to the point of gleaming. We know that each flooring material presents its own set of benefits and challenges, as well as a distinct “look”. So, which factors do we consider when choosing a flooring material for our homes? How do tile, carpet and hardwood rank in terms of cost? Durability? Sustainability? Below we delve into a comparative analysis of the three flooring giants. It’s likely you have some personal preferences when it comes to the surfaces in your home. Earthy but sleek hardwoods. Versatile and cozy carpets. Elegant tiles. There’s no accounting for personal taste. Neither is there any absolute answer when it comes to choosing flooring material—only what’s right for your circumstances. However, there are some ideas to take into consideration. What kinds of flooring make sense for which areas of your home? Think of how carpet creates a sense of warmth, while long planks of hardwood can give the impression of openness. Would you prefer hardwood or carpet in the family room? Tile or hardwood in the kitchen? However, if you have multiple kinds of flooring in your home, you might consider how each room contributes to the whole. 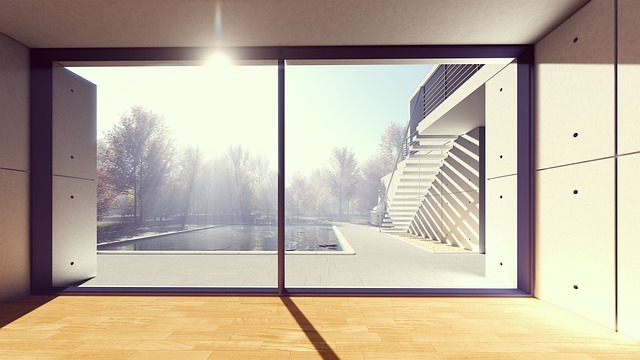 Are you looking for Wright-esque, seamless transitions or distinct divisions between rooms? Choosing a light tile adjacent to a light carpet, for instance, allows your eye to carry through. There’s a fluidity to it that draws your gaze along. Alternatively, you might opt for a dark wood and a light carpet. The effect of this is to create two distinct environments. This can be useful if you want one room to be more casual, while the other to be more formal and elevated (as between a kitchen and a dining room). Pinning down numbers is tough. Depending on your location and supplier, cost varies greatly when it comes to flooring material. In terms of outright price, tile is often the most economic option. 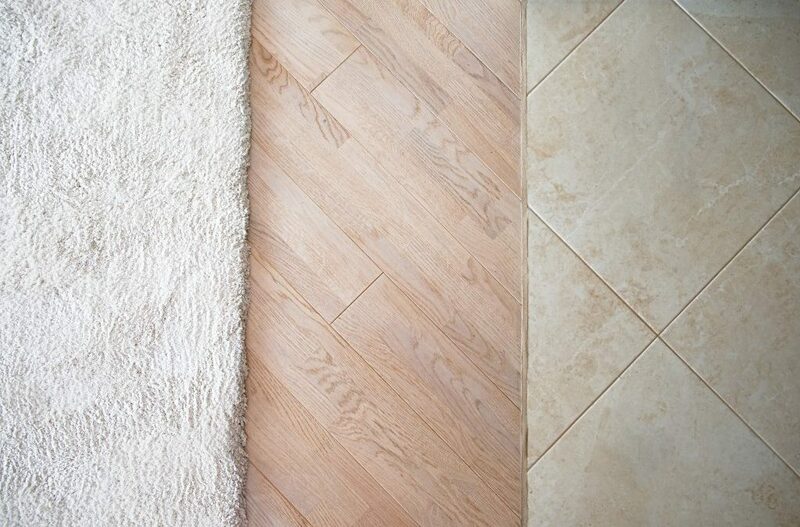 Porcelain and ceramic varieties of tile are generally cheaper than carpet or wood. In fact, a square foot of tile typically doesn’t run more than 10 bucks. Hardwood is almost always the most expensive choice. Coupled with installation fees, the national average is about $4,000. But, $8,000 isn’t uncommon depending on the cut, quality and quantity of the wood. However, having good quality wood in the home significantly increases its resale value, so if you plan on putting your house on the market this could be a smart long-term investment. Due to the extensive variety of carpets on the market, it’s nearly impossible to name a price. This is further complicated by the fact that installation charges are sometimes included in the cost of the carpet. As a general rule, most types of carpet fall somewhere between the price of tile and hardwood, but the only way to make certain of a price is to get a quote. When considering cost, it’s also important to take into consideration repair and resale value. Quality hardwood floors, for instance, may help sell homes more quickly and at a higher price. It also might be an opportunity to reduce your capital gains tax. Depending on the state, hardwood could be considered a capital improvement. However, the return on investment is difficult to calculate, so if you’re serious about selling your home it’s worth asking a local realtor about. 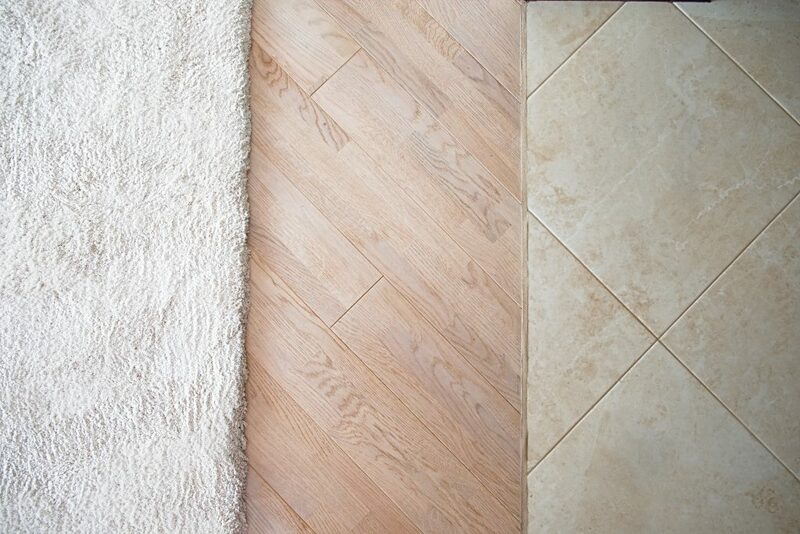 As for repair, tile requires virtually no maintenance, especially ceramic varieties. Carpet requires regular professional cleaning and has a much shorter lifespan than the other two flooring materials. Hardwood requires some basic maintenance. Summation: studies show that tile is generally the most economic option, although if your house is on the market you may gain more from hardwood or high quality carpet. When it comes to flooring it’s very much “you get what you pay for.” Of the three, carpet is the most susceptible to staining and requires professional cleaning every 18 months in order to maintain the warranty. Tile and hardwood may be more durable, but they don’t create the same sense of warmth and refinement that a good carpet does. There’s the trade-off. Your carpets will need to be replaced every ten years or so, but hardwood lasts well over a hundred years, and tile even longer (assuming its well taken care of). This ties back to cost because while hardwood will initially cost you more money than carpet, it can save you money if you plan on being in the home for more than a decade. A “green” flooring material must be more than just recyclable. Is it processed in a way that’s toxic to the environment? Can it be recycled? How is it maintained? Hardwood flooring is biodegradable, recyclable and renewable—so long as the wood used is certified by the Forest Stewardship Council. The biggest issue posed by hardwood is its emission of volatile organic compounds (VOCs). Most varieties of tile—whether glass, metal, porcelain or ceramic— include a percentage of reused materials and are produced in closed loop facilities, or facilities that reuse materials and water. Additionally, those that are fired in a kiln are also hypoallergenic because VOCs are killed in the heat. Ceramic and porcelain are not just good for the environment, they’re also good for allergies. It was once believed that carpet was a factor in indoor air pollution, not only because it emitted VOCs but also because it’s an excellent trap for pollen, dust and chemicals. Now, we know differently. First, many chemical-free varieties are available. New carpet actually has the lowest emissions of the three flooring materials. After installation and ventilation, VOCs drop to a negligible amount. Second, carpet is actually an asset to good indoor air quality. In a study conducted by the Carpet and Rug Institute, researchers discovered that the air above carpet had far fewer microbes and mites. The fact that carpet acts as a trap is in fact a benefit. It removes particles from the air until vacuuming, meaning fewer particles end up in your respiratory system. A green carpet also includes a recycled cotton pad. Unfortunately, most carpet isn’t biodegradable. Although, it may be recyclable! Check with your local solid waste district to see which centers accept carpet. Whatever flooring material you choose for your home, Zerorez’s revolutionary cleaning systems keep household surfaces looking good as new. Odors, microorganisms and stains don’t stand a chance against our Empowered Water and extraction wand. 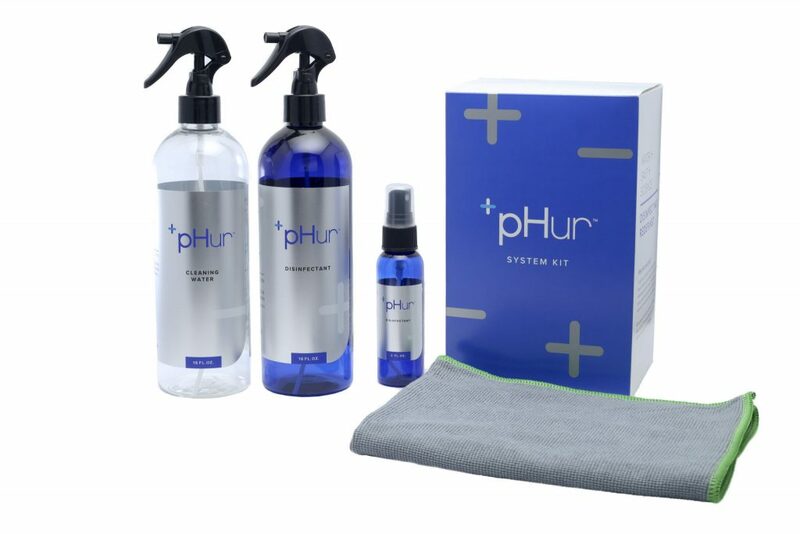 This duo is a powerful cleaning solution that does the job without detergents, soaps or toxins. For more information check us out at zerorezsocal.com or give us a ring at (949) 387-2222.